“Less food + more exercise = less weight”. Unfortunately, a lot of people believe this factually incorrect notion. Even some conventional doctors still go around touting this as the way for their patients to become healthier. Well, I’m here to discuss with you why this is not the case! After all, if this were true, wouldn’t everyone be skinny and healthy? At first, this equation might seem to work. You eat less food and you lose the weight, especially if you’re also exercising. 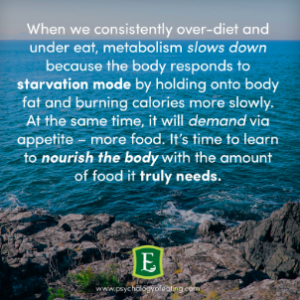 However, once we’ve reached a certain point, our bodies realize they aren’t receiving much sustenance, and they go into starvation mode. This is an evolutionary tool designed to make sure we survive even if we’re stranded on an island with little to eat. Our metabolism slows down to ensure that we have enough calories to sustain ourselves. Our bodies also hold onto fat, not optimal if you’re looking to lose weight. Another problem with this belief is that it assumes all calories are created equal. But does it really make sense that 70 calories of ice cream is the same as 70 calories of carrots? The answer is a definitive “NO”! Our bodies use the nutrients we give it as information. If we eat healthy foods, it sends a different message than if we eat unhealthy foods. Now please notice that I’m not saying “good” or “bad” foods here. Food isn’t inherently one or the other, and saying it’s good or bad places a moral responsibility on it that doesn’t exist. If we eat a so-called “bad” food - and think of it that way - it places us in an automatic stress response; we’re a bad person for eating bad food. This leads to decreased digestion, assimilation and absorption. So, if we’re eating a food that is actually healthy for us, but we think of it as “bad” for whatever reason, we might be getting less out of it than if we ate an unhealthy food but think of it as “good”. The point here is not to think that foods are either good or bad. After all, the dose makes the poison. Eating a bite or two of dark, organic chocolate is not bad for you. But eating two whole bars of milk chocolate might not be the healthiest option for your body. As I understand it in a nutritional sense, this equation basically says that energy has to come from somewhere, and that energy and mass are the same thing in different forms. So, if you’re not fueling your body with healthy foods, it has to make up for it elsewhere. This is why so many people are exhausted and not losing weight even though they restrict their calories and do a lot of exercise. If your body isn’t fueled correctly, how can it run? If you fill it up with food that it can’t use easily (i.e. processed food that gets stored as triglycerides and can’t be accessed), it will continue to be hungry. This is like putting diesel into a car that requires unleaded and wondering why it isn’t running properly. Processed foods simply do not contain the necessary nutrients our bodies need. This is why you can eat junk food and still feel hungry afterward: the body is telling you it still needs something. 1. If your diet is fairly unhealthy and you’re not working out at all but you wish to lose weight, focus on your diet first. You have to fuel it up with the foods that are going to enable you to have the energy to exercise. If you’re eating out a lot, or eating a lot of processed foods, you’re not going to have a lot of energy. If you eat this kind of diet and try to exercise your weight off, you’re going to have no energy! First fuel your body and then focus on body movement. This will ensure that you’re only tired because of the new movement, not because you’re running on empty. 2. Another tool to consider is your breath. As I’ve discussed before, slowing down while you eat puts you into the relaxation response-- this is where our body is designed to be in order to digest and assimilate to the best of its ability. In addition to this, breath can also enhance your metabolism. Breath is the oxygen to the fire of our calorie-burning capacity. Imagine, being able to improve your metabolism just by breathing more! 3. Something else to consider is the fact that what we hold as truth is always changing. After all, a few years ago we were told to have a diet of mostly carbohydrates and to avoid any kind of fat. Now we know that we should actually be doing the opposite! Science is always discovering something new. This is why it’s so very important to listen to your own body and see what works for you personally. These cues are the single most important tool you have. I hope you found this interesting and helpful! I look forward to chatting with you again next month about “the perfect diet”. Until then!